Goat Hill Pizza reminds me of college. I used to go to their Potrero Hill location in San Francisco frequently during grad school, when I lived in the city and the restaurant’s Monday night all-you-can-eat pizza special was a welcome break from working on my thesis. Nowadays, I visit only once or twice a year, and the lines for a freshly-baked slice or ten are still just as long. Diners can expect to wait upwards of an hour to be seated, but once you’re at a table, the fun begins. 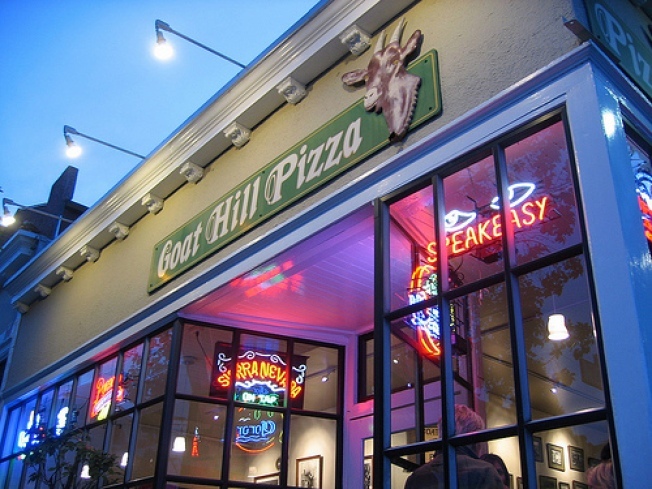 The method is simple: Goat Hill Pizza’s waiters come around every few minutes or so with a different kind of pizza. If it looks good, you raise your plate and they give you a slice. Continue until you’re stuffed. It’s fun for the novelty factor, but the pizzas are hit or miss. The ones that are heavy on the garlic are my favorite, but all too often a waiter will come around with a ham and pineapple combo three times in a row, or what seems like an endless supply of only pizzas with bell peppers. Or worse yet, you’ll spot your favorite combination but by the time the waiter gets to your table, they’re all out.